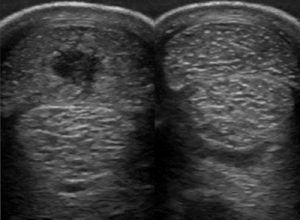 DIGITAL ULTRASOUND can be used to view a variety soft tissues such as tendons and ligaments to aid in the diagnosis of lameness problems or as aid to colic diagnosis by scanning the abdomen. 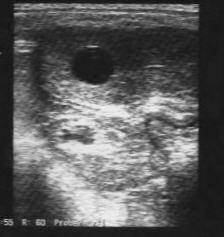 Ultrasound is regularly used in the diagnosis of pregnancy and to aid the timing of artifical inseminations, monitoring the growth of ovarian follicles to determine ovulation timing. Cross section view of digital tendons showing large core lesion in the Superficial Digital flexor tendon. These lesions can be successfully treated with Stem cell therapies. 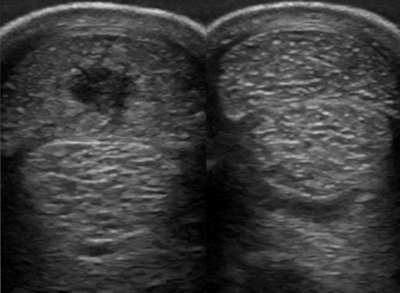 Ultrasound examinations allow the confirmation of pregnancy, here a single 16 day old conceptus (left) and helps eliminate twining. 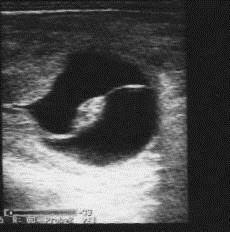 Later a heart beat scan can be recorded from around 25 days (right). 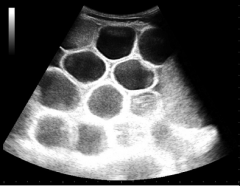 Ultrasound can also be valuable in colic investigations to identify dilated loops of intestine which may indicate a ‘surgical colic’ allowing a faster referral.